Cleaning gutters may be the most overlooked home maintenance job—for obvious reasons. Most homeowners cannot see into their gutters, and are not aware of the debris that can build up in them. Many do not realize the damage that clogged gutters can cause. And even those homeowners who do understand the importance of maintaining clean and functioning gutters shy away from the prospect of climbing on ladders or onto their roof to undertake what can be a messy and even dangerous job. Still, maintaining clean gutters is work that is too important to ignore. Gutters play a critical role in moving rainwater away from your house where it can do no damage. If your gutters are clogged with leaves, branches, shingle granules and other debris, they cannot function properly. Rainwater, instead of running through the gutter system and down your rain spouts, will cascade over your gutters and down exterior walls, possibly damaging landscaping but more importantly saturating the ground around your foundation. In a worst-case but all too common scenario, the water can weaken your foundation and enter your home, damaging the interior of your house and promoting the growth of mold. We recommend that most homes have their gutters cleaned once or twice per year – sometimes more often for homes located in densely wooded areas where twigs and leaves can accumulate quickly. Squeegee Klean offers a gutter cleaning service that removes all debris except asphalt shingle grit from your gutters. Don’t risk life or limb by climbing on ladders or clambering across your roof to tackle the messy but important job of cleaning your gutters. Instead, call the pros at Squeegee Klean gutter cleaning service and leave the climbing, and cleaning, to us. We have a $100 minimum service charge for all gutter cleaning jobs which may also be subject to job location. Be sure to call or email us today to schedule your cleaning !! 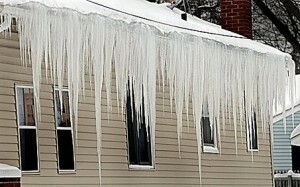 If not, your gutters might look like this over the winter months. “Ice Damming” can be very problematic. It can cause your gutters to tear away from the roof line and also cause water to back up into your home which can cause mold to form. Both of these problems are very costly to deal with and can be stopped before ever occurring. By cleaning out your gutters in the fall and removing the snow from the first 3 feet of your roof line will save you a ton of money. If your looking for a professional to assist you with those dangerous but necessary chores please be sure to contact us today.